While rummaging through the 2,675 loose recipes around my house, I found one from 2006 that was whispering my name: a simple soup from the Mean Chef collection, which was perfect for one of last week’s chilly evenings. Cook the orzo until al dente (do not overcook). Drain well and reserve. Heat the oil in a large saucepan and saute the onion and serrano pepper for a few minutes, until the onion is translucent. Add the garlic and chicken pieces, and saute for a couple of minutes longer. Add the chicken broth, lime juice, and tomato. Bring to a boil and simmer gently until the chicken is cooked through. 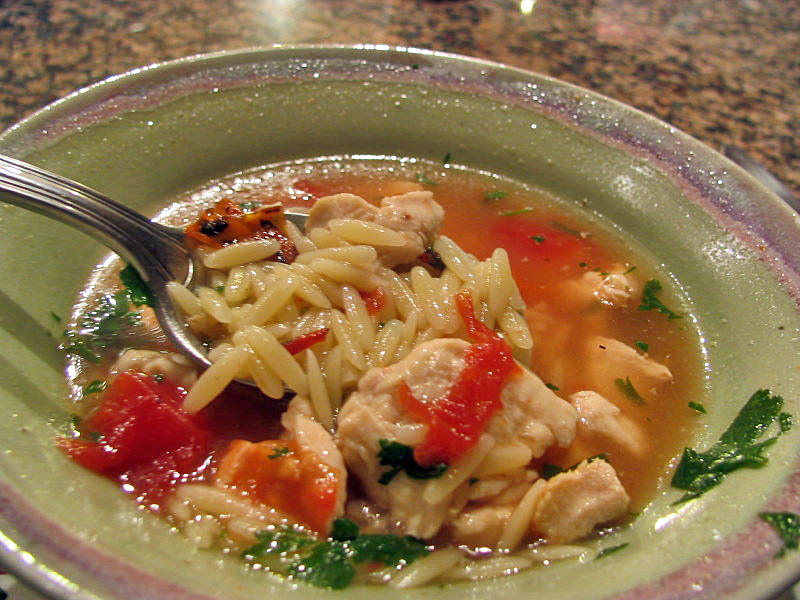 Mix in the cooked orzo, season with salt and pepper, then add cilantro just before serving. Comments: I’d love to say that I always use homemade chicken stock, but it’s not true. In a pinch I may use packaged stock, because it makes life easier. But, in two instances I stay with my precious homemade version: when making soups or risotto. The flavor of the broth is powerful in these dishes, and your taste buds will appreciate the high road, as illustrated by this soup. Please don’t skip the lime or the pepper, because without them this simple soup will be bland. We like the flavor of cilantro, but members of the Cilantro Haters Association may skip it. I never understood the advice to substitute parsley for cilantro, because apart from color, they have little in common. But, I suppose a little parsley won’t hurt anything in this soup.